The weather in May was fit for Goldilocks, with a beginning that was too hot, an end that was too cool, and a middle that was just right. Despite the myriad of unique meteorological occurrences, two episodes stand out as highlights from a remarkable weather month: dry heat and cold rain. A heat wave of almost unprecedented duration at the beginning of the month sent some areas soaring above 90 degrees for six consecutive days. Not since 1992 has the state experienced widespread 90 degree temperatures so early in May. Ten days later, however, a cold storm stalled over Washington for several days. From May 21st to 24th, the state waded through unusually raw late spring days that saw heavy rain, wind, and high temperatures only in the 40s and 50s. The Yakima area was the big winner (or loser) of the event, with amazing storm rainfall totals of up to 2.5 inches. Overall, numerous records for heat, cold, and rainfall were set during the month, including earliest widespread 90 degree weather, coldest May high temperature, and largest May rain event. Amazingly, the average Prosser high temperature from May 1st to 12th was 83.3 degrees (11 degrees above the long term May average), while the average high from May 20th to May 31st was only 66.3 degrees. Overall, May temperatures were generally 1 to 2 degrees above average across Washington. Although any one of these events would be inherently notable, May becomes extraordinary when the entire month is considered in context. Two diametrically opposed climate anomalies occurred during a single month, and in reverse climatological order. The drastic transition from the early parched heat to record wet and cold later in the month make May of 2013 singularly unique. Like March and April before it, May temperatures were above average, which allowed for a notably warmer than average spring. However, May was without question the most historically significant month of the season. March weather was changeable, but generally drier than normal and warm during the day. A strong storm on March 20th provided the weather highlights for the month, which included rain, heavy mountain snowfall, strong winds, and rapid temperature changes. 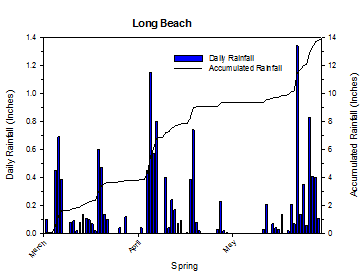 Despite an unusually warm start, cool and wet weather arrived on April 4th, which led to 3 inches of rain in just four days at Long Beach. A powerful storm on April 12th again spawned rainfall, mountain snow, and wind gusts up to 66 mph, and left behind unsettled and frosty weather for the mid month period. The warmest weather of April arrived on the 26th, with highs reaching the 70s in southwestern Washington, and 80s in eastern areas. Alas, another dynamic spring weather system provided more precipitation and wind on April 29th. Overall, April was slightly warmer than normal east of the Cascades. Despite several weather highlights during March and April, May is certainly in a league of its own compared to the relatively ordinary preceding spring months. 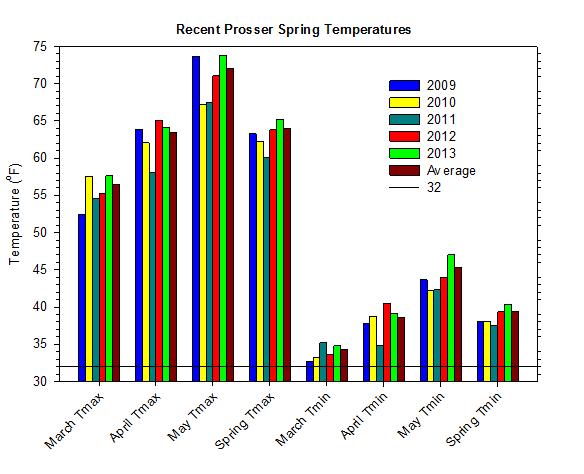 Both May and the spring season were the warmest at Prosser since 2005, which breaks the recent streak of cool springs. 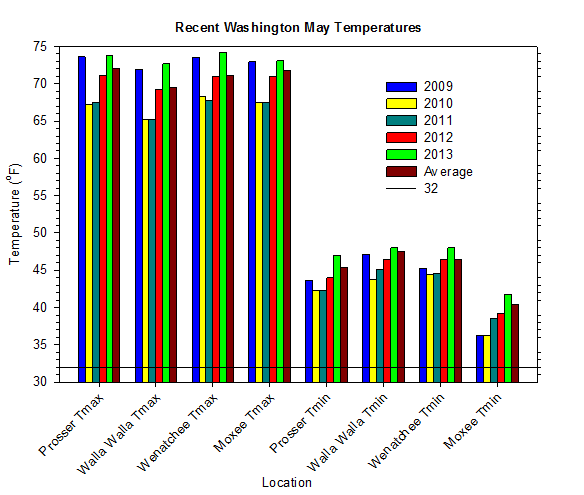 Spring temperatures were generally around one degree above average across Washington. May began with very cold morning temperatures, including a monthly record low of 30 degrees at WSU Tri-Cities. Overall, low temperatures as cold as 18 degrees at Ritzville and 21 at Moxee were recorded on the 1st. However, sunny skies allowed for a nice rebound into the mid 50s to 60s by afternoon. A few areas were again below freezing on the morning of the 2nd, with lows as cold as 29 degrees at LaCrosse, although afternoon temperatures reached the 70s in many areas. Increasingly warm weather arrived on May 4th, with widespread 80s in most areas, including near the coast. Highs on May 5th reached the mid 80s in parts of western Washington from Long Beach to Whatcom County, as well as in north and south central Washington. Low temperatures were as warm as the upper 50s in some areas. Otherwise, the weather was sunny, dry, and warm. Highs on May 6th were as warm as 90 degrees in central Washington and upper 80s in parts of the Puget Sound. It marked the earliest date in the spring that any AWN site has hit 90 degrees since 1992. Low temperatures were as warm as 64 degrees at Wahluke Slope. As expected, however, the immediate coast cooled quickly, with highs of around 60 degrees. May 7th was a near repeat, with high temperatures as warm as 92 degrees at Loomis Valley, and lows in the 60s in some areas, including 68 degrees at Wahluke Slope! High temperatures were as warm as 93.4 degrees at Desert Aire on May 8th, with lows as warm as 64 degrees at Parker. On May 9th, the high was 96 degrees at Orondo, but only 58 degrees at Long Beach, while the low temperature at Parker was a balmy 66 degrees. May 10th and 11th were toasty as well, with highs in the mid 90s in the hotter areas. On May 10th, Hundred Circles surpassed 97 degrees. Orondo was above 90 degrees for six consecutive days from May 6 to 11. Clouds finally increased on May 12th, as rain fell in western Washington, with as much as 0.85 inches recorded at Lawrence in Whatcom County. High temperatures lingered in the upper 80s around the Tri-Cities, while slightly cooler temperatures in the mid 70s to low 80s greeted the rest of central Washington. Meanwhile, areas west of the Cascades settled into the 60s and low 70s. Cooler and more seasonal conditions in the 60s to mid 70s finally spread across Washington on May 13th, along with breezes, showers, and even thunderstorms. As a storm system swept through the state, as much as 0.4 inches of rain fell in the Mt. Vernon area, while around one-third of an inch was recorded in parts of eastern Washington. Winds gusted as high as 40 mph at Huntsville, with sustained winds nearing 30 mph. The weather system ushered in a period of more seasonal conditions that persisted through mid May. May 14th was a quieter but still partly cloudy day, with high temperatures that ranged from the upper 50s at the coast to the low 70s in central areas, and lows in the upper 30s to 40s. Highs were again pleasant in the mid 60s to mid 70s on May 15th, except cooler in southwestern Washington, as low temperatures varied from the 30s to the 50s. Around one-tenth of an inch of rain was recorded in parts of western Washington. After continued seasonal weather on May 16th and 17th, breezy conditions returned on May 18th, along with nearly 0.4 inches of rain around the Mt. Vernon area and the Omak area. Widespread mid to upper 70s were observed on May 19th in central areas. May 20th was a sunny and warm day, with high temperatures around 80 degrees in the warmest areas, making it the warmest day since the end of the early May heat wave. However, big changes were in the offing, as light rain moved into southwestern Washington late on May 20th. On May 21st, a cool upper low moved into western Washington, bringing showers and thunderstorms to the lowlands, snow to the mountains, breezy winds, and cool day-time temperatures for a prolonged period. The highest daily rain totals included Konnowac Pass, which experienced one inch of rain, and Toppenish, which recorded nearly an inch and a half, as well as 0.82 inches at Snohomish, and 0.77 inches at Quincy. Pea sized hail in the Quincy area caused scattered crop damage. Sustained winds of up to 30 mph were recorded at St. John, as day-time temperatures in rainy areas dropped into the 50s and 40s! May 21st was a strange weather day, with rain-cooled temperatures in the 50s and 60s in central areas, but 70s in the normally cooler eastern areas around Pullman and Spokane. Pullman, for example, recorded a high temperature of 73 Degrees at 11 am, before a strong cold frontal passage sent temperatures plummeting to 49 degrees by 3pm. It is extremely rare for such strong temperature declines to occur during the peak heating time of day, especially at this time of the year, when the potential solar radiation is nearing its annual maximum. Paradise, Mt. Rainier received a foot of new snow during the overnight period of the 21st and into the morning of the 22nd, with snow falling at elevations below 2000 feet in some areas around Mt. Rainier and the Yakima Valley. South central Washington received additional significant rainfall on May 22nd, as a band of moisture stalled over the region. Areas around Yakima received two-day totals in excess of 2 inches, most of which fell in less than 24 hours. Ironically, while one of the normally driest parts of the state received heavy rainfall, typically "wet" areas received relatively little rainfall. Despite breezes and moist conditions, low temperatures dropped into the 30s in parts of eastern Washington on the 22nd. High temperatures only reached into the 40s and 50s on a raw and windy May 22nd, including 45 degrees at Wenatchee Heights, and 46 degrees at Gleed. For the Yakima area, May 22nd was the latest date ever to experience such cool high temperatures. For example, the high of 48 degrees at Cowiche on May 22nd was a record for the month of May (1989 to present). In fact, prior to this event, Cowiche's high temperature had not been below 50 later than April. Also, the May 21/22 rain event was the largest May storm total rainfall on record at Parker, and one of the largest rain events in recent history. By the morning of the 23rd, temperatures dropped as low as 29 degrees at Pullman and LaCrosse. High temperatures on May 23rd were slightly warmer, but remained in the 50s in areas of central/eastern Washington including Pullman and Cowiche. High temperatures in southwestern Washington were as low as 50 degrees around Olympia, with 1.3 inches of rain falling at Long Beach. 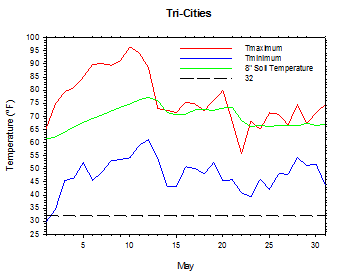 Low temperatures on the morning of May 24th were again frosty in the Pullman area at 31 degrees. Additional rain fell on the morning of May 24th in the Yakima area, with three-quarters of an inch in places like Cowiche. Saturday, May 25th was mostly sunny and more seasonal in parts of central Washington. 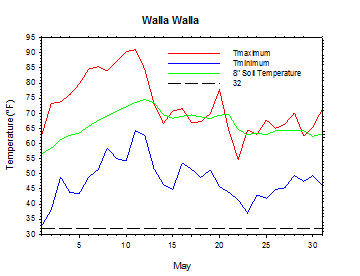 However, very cool day-time conditions returned on May 27th in the Yakima to Wenatchee corridor, with highs again failing to reach 60 degrees in many locations due to clouds and light rain. 0.83 inches of rain fell at Long Beach on May 27th, with more than one-half inch in most of southwestern Washington. All the while, lows remained fairly seasonal in the 40s and 50s. Temperatures rebounded on the 28th, with highs in the upper 60s to mid 70s in central areas and mainly 60s elsewhere. Light rain on May 28th amounted to 0.41 inches at Long Beach. On May 29th, much of southwestern Washington received significant rainfall, while up to one-third of an inch fell in the Yakima area. Most areas topped out only in the mid 50s to 60s. May 30th was a transition day, as most areas dried out. However, a Puget Sound Convergence Zone dropped upwards of 0.75 inches of rain in the Mt. Vernon area. Following a very cool ten days, the month ended on a sunny and warm note on May 31st. 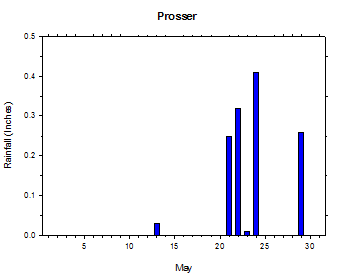 The average May temperature at Prosser (WSU IAREC) was 61.3°F, which is 1.7 degrees above average. The average high temperature was 73.8°F, which is 1.7 degrees above average. The average low temperature was 47.0°F, which is 1.7 degrees above average. The maximum temperature recorded last month was 93.3°F on May 10th, while the coolest daily high was 54.7°F on May 22nd. Low temperatures ranged from 61.7°F on May 12th to 31.8°F on May 1st. Daily average temperatures ranged from 76.0°F on the 11th to 46.0°F on the 22nd. The monthly precipitation total was 1.28 inches. 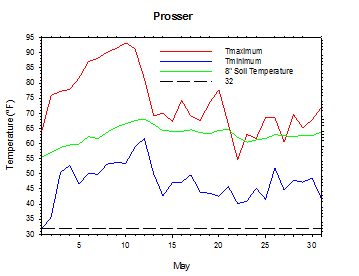 The average wind speed was 4.7 mph, and the average 8 inch soil temperature was 62.8°F. Wenatchee (WSU TFREC) recorded an average temperature of 61.9°F, which is 2.4 degrees above average, while Walla Walla's average monthly temperature of 60.5°F was 1.8 degrees above average. 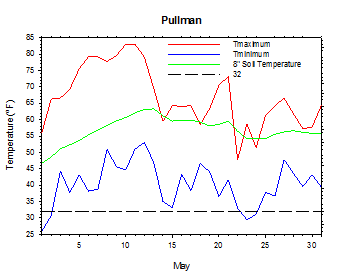 Pullman was one of the cooler spots in the state, with an average May temperature of 54.4°F. In western Washington, Mt. Vernon's average temperature was 55.4°F, which is 1.6 degrees above average. May 1st: The low temperature at Ritzville dropped to 18 degrees. May 7th: The low temperature at Wahluke Slope was a mild 68 degrees. May 10th: The high temperature at Hundred Circles soared to 97 degrees. May 22nd: The high temperature at Gleed was only 46 degrees. May 22nd: 1.01 inches of rain fell at Moxee. May 23rd: The low temperature at Pullman plunged to 29 degrees. 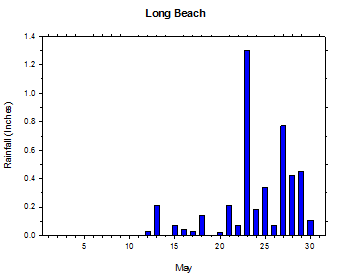 May 23rd: 1.3 inches of rain fell at Long Beach. May 24th: The four day storm total rainfall at Konnowac Pass was 2.4 inches. Temperatures in March were generally slightly above average due to the warmer than normal day-time conditions, although there were significant week to week weather changes. The most exciting weather event of the month was a potent storm that slammed into Washington on March 20th. In advance of the weather system, more than one inch of rain fell in southwestern Washington. A strong cold frontal passage produced wind gusts up to 65 mph at Huntsville, along with plummeting afternoon temperatures of 20 degrees in 30 minutes at College Place. As the storm departed, several inches of snow fell in the Everett area on March 22nd, while Mt. Rainier observed around 2 feet of snowfall. Generally, March was a variable, yet somewhat drier than normal month. During April, temperatures were generally within a normal range, with slightly above average conditions east of the Cascades, and slightly below average temperatures in the west. 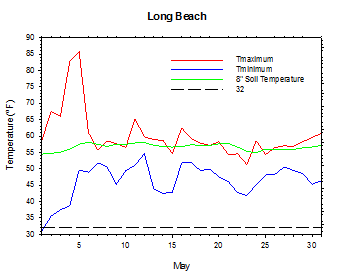 Temperatures were in the 70s on April 1st, but cooler and wet weather from April 4th to 7th brought 3 inches of rain to Long Beach. A strong storm and frontal passage on April 12th promoted rain, mountain snow, and wind gusts up to 66 mph. In the wake of the storm, cool, breezy, and unsettled weather during mid April caused poor pollination conditions during the critical time period of bloom. 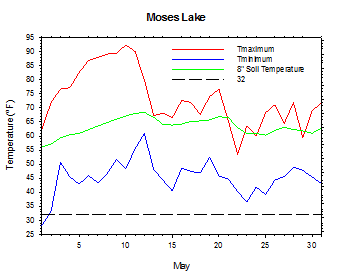 Moxee experienced 8 consecutive frost mornings from April 11th to 18th, and 15 sub-freezing mornings during the April 8th to 24th time period. Later in the month, temperatures warmed to 77 degrees at Vancouver and 86 degrees at Desert Aire on April 26th. At that time, it was the warmest weather since September 29th, 2012. However, another strong storm on April 29th led to more rainfall and mountain snow, as well as winds of up to 50 mph, and temperatures as low as 22 degrees. The average spring temperature at Prosser (WSU IAREC) was 53.1°F, which is 0.9 degrees above average. The average high temperature was 65.2°F, which is 1.2 degrees above average, while the average low temperature was 40.3°F, which is 0.9 degrees above average. Daily high temperatures ranged from 93.3°F on May 10th to 43.1°F on March 6th. 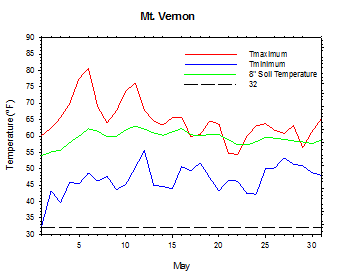 Low temperatures varied from 61.7°F on May 12th to 23.9°F on March 4th. Daily average temperatures ranged from 76.0°F on May 11th to 36.4°F on March 23rd. 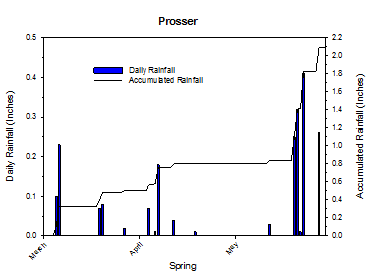 2.09 inches of rain fell during the spring season. The average wind speed was 5.5 mph, while the average 8 inch soil temperature was 54.1°F. Other locations also experienced above normal spring temperatures. 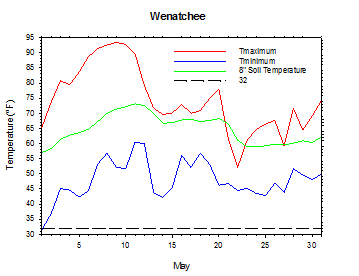 Wenatchee (WSU TFREC) had an average seasonal temperature of 52.8°F, which is 1.4 degrees above average. 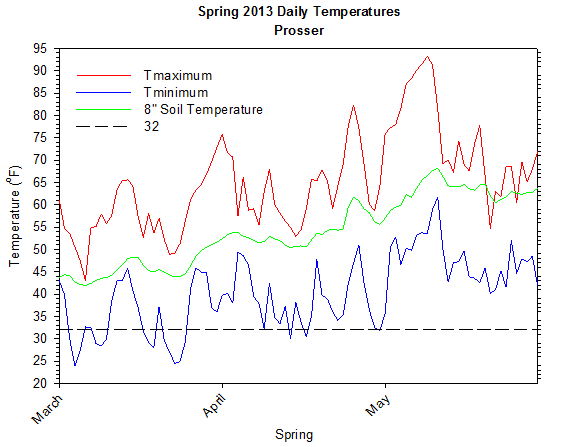 Overall, the spring of 2013 was 0.9 degrees warmer than the last spring at Prosser (WSU IAREC). March 24th: The low temperature at Benton City fell to 18 degrees. March 31st: The temperature at Montesano rose to 76 degrees. 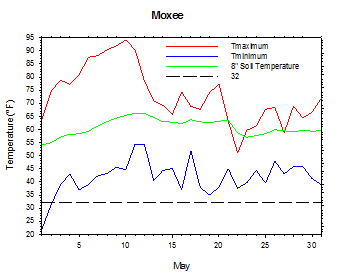 April 14th: The temperature at Moxee dipped to 22 degrees. April 26th: The temperature at Desert Aire climbed to 86 degrees. May 11th: Orondo completed a six day stretch of high temperatures of greater than 90 degrees. May 22nd: One foot of snow fell during the early morning at Paradise, Mt. Rainier. May 31st: Prosser ended the month just 1.7 degrees above average, after having already been more than 11 degrees warmer than normal by May 13th. March: Warmer than normal during the day. April: Slightly warmer than normal. May: From hot and dry to cool and wet. Pea-sized hail associated with storm activity near Quincy on May 21st caused some moderate damage on the apple crop in the region (Karen Lewis, personal communication). Otherwise, cool and wet weather late in the month delayed the harvest of the first cutting of alfalfa. However, the moisture was welcome in Whitman County and elsewhere in eastern Washington, where hot and dry weather earlier in the month had significantly stressed the dry land crops. Planting of dry beans in Grant County was proceeding slowly as of May 28th, although corn and potato planting was mostly complete. Significant rainfall in Yakima County necessitated the use of drying techniques on early cherries in order to prevent cracking. Generally, a light cherry crop was observed due to poor pollination conditions and frost during April. Winter wheat in Walla Walla County showed significant frost and drought damage. Otherwise, grapes began to bloom in Klickitat County, while Snohomish County raspberries were in full bloom in late May (National Agricultural Statistics Service). On May 12th, 1993, the temperature at Prosser (WSU IAREC) soared to a monthly record of 98.4 degrees. According to the Climate Prediction Center (CPC), warmer and drier than normal conditions are expected in Washington during June. Similar conditions are expected to persist into the early autumn.